An electronic cigarette, otherwise known as a Personal Vaporizer (PV), is a battery-powered device that provides inhaled doses of nicotine by way of a vaporized solution. It is an alternative to smoked tobacco products, such as cigarettes, cigars, or pipes. In addition to nicotine delivery, this vapor also provides a flavor and physical sensation similar to that of inhaled tobacco smoke, while no tobacco, smoke, or combustion is actually involved in its operation. 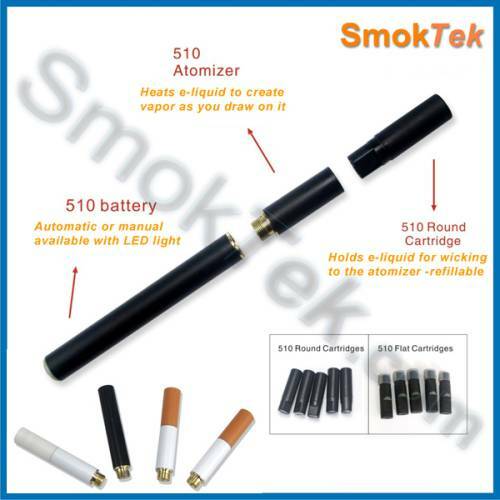 The smaller 510 style e-cigarette tastes, feels and looks like a normal cigarette while the bigger e-smart and eGo models provide much more vapor and taste with a very different feel. All of them can contain nicotine in varying levels but most of the other 4000+ toxic nasty substances such as arsenic and formaldehyde have been removed. It is far cheaper to "vape" than smoke the tobacco equivalent, it is odor free and you can smoke the e-cigarette in most public places! This is a great way to try an e-cig without breaking the bank! Ok! It's time to go shopping! Click here to check out our Featured Products.